How Do Popes Get Around? Nope; the white smoke meant the cardinals had elected a new pope. Reminded me of the mid-1980s when the then-pope (John Paul? Can't remember...) visited Canada. A specialty vehicle manufacturer in Montreal modified a General Motors pickup truck to transport him around. A CBC radio show (also can't remember which one...) ran a listener contest to come up with a more appropriate name for this vehicle than 'Popemobile'. Even the Pope apparently thought that term wasn't 'dignified'. And no, it was not my entry. Walt McCall, the-then PR manager for Chrysler Canada, suggested his company should have built that vehicle. "We could have called it the 'Jesus Chrysler'." I just watched the 'Up Close Open Mic' feature on Sportsnet with new Blue Jay R. A. Dickey. Not only is this guy a fabulous pitcher - the current National League Cy Young award holder is expected to lead the Blue Jays to heights not seen since the early 1990s. But in this series of interviews, and in all cases where he has dealt with the public through media contacts, he appears to a most thoughtful, intelligent, serious and articulate man. His references to his wife and children also reveal him to be a God-fearing family man. He notes how his family is looking forward to getting to know their new country, learning our culture and our customs. Welcome to Canada and to Toronto, R. A. But allow me to introduce you to one Canadian custom with which you do not appear to be familiar. In part of this TV show, Dickey is shown driving his car through downtown Toronto traffic. He comments that it is not as congested as the New York City he is used to. But as you can see from this still clipped from that show, Dickey is not wearing his seat belt. By the way, this is not merely a Canadian custom, my man. It stuns me that someone apparently this smart and this devoted to his family would do this. If he wants to grow old to enjoy those children that he loves so much, I beseech him to wear it at all times. Even religious people will say that God helps those who help themselves. If you get hit head-on by some drunk - it happens - your seat belt will help a lot more than faith in any god. We have lost too many athletes who thought they were above the laws of physics. Former NHL defenceman Steve Chaisson immediately comes to mind. Dickey's knuckleball may appear to be defying those laws. But if his unbelted body is hurtling towards his steering wheel and dashboard at 50 km/h - about half the speed of his knuckleball - it is going to end very badly. Given that Dickey is a public figure and stands to be a role model for all our children, I beg of him: please R.A. - set the right example. Oh yeah - and win 20 games. So you think young people aren't interested in cars any more? You should have been with me at the Toronto Auto Show today. I was standing beside my Kia Optima Turbo Targa Newfoundland car, and there was no shortage of kids (of all ages) wanting to sit behind the wheel, making the classic 'vroom-vroom' noises, even if most of them couldn't see over the bottom of the steering wheel rim, let alone out the windshield. I wish I could show you some photos of the kids, but there are various issues about printing candid photos of children. So I'm just including a shot of the car. Rocks, fog, fishing boats - could that be anywhere but Newfoundland? Quite a few of these kids were girls too, and most of them knew that Danica Patrick is on pole for Sunday's Daytona 500. I've always maintained that car racing is one sport where women don't have a built-in disadvantage. There's no real need for huge muscle mass or upper-body strength in racing, where women generally trail men. If you think that competitiveness is solely a function of testosterone, well, did you ever see the Williams sisters play tennis? Given that weight is always the enemy of race cars, there's actually (typically) an advantage for women here. NASCAR in fact has a weight equalization rule; lighter drivers have to add ballast. But because of the way the formula works, Patrick - who only weighs about 100 pounds - has to carry just a 40 pound penalty, so she probably gains about a 40 - 50 pound net benefit over most of the field. Given the size and weight of NASCAR cars, this might not be as crucial proportionally as it might be in a lighter formula car. But when races are won by hundredths, sometimes thousandths, of a second, every bit helps. Whether any of these kids become our next Paul Tracy - or Danica Patrick - it seems that enthusiasm for the automobile is alive and well in our young people. Happy Hannukah, Smashing Solstice, Festive Festivus, Quintessential Quonset Hut (that's Jil McIntosh's line) - whatever holiday you're celebrating, have a good one. Even if you're not celebrating at all, just, well, BE HAPPY! We're the fourth-round draft choice for Christmas dinner this year - three of the four sprogs are with their respective significant others' families on The Big Day this year, so we're not having our Christmas dinner until Tuesday. Yep, in my beloved 1977 American Motors Hornet hatchback. According to a British news report, a group of Druids has lost its traffic safety gig in Austria. It seems that the latter-day remnants of this Iron Age Celtic religious sect - who some believe built Stonehenge, although current archeological theory refutes this - do in fact have some efficacy with stones: apparently, certain types of stones, placed in spots only a Druid could divine (with 'mystical divining' rods, no less, according to the Arch Druid) can absorb the 'negative energy' that exists in certain stretches of roadway, resulting in fewer car crashes. This theory sounds reasonable to me - it's as least as reasonable as that behind the behaviour of other forms of quasi-religious folks, who paint runic numbers on signs posted along the side of the road and somehow expect drivers to match their speed to these numbers. But Austrian transportation officials have cancelled the Druid program, due to budgetary constraints. It seems the multi-year program has been kept a secret up until now. Gosh - I wonder why. In any event, there appear to be some traffic-calming Druids looking for work. Wonder if we could invite them to come over here and put some stones along the 401 near Mavis Road? OK, understand that anything hanging from your rear-view mirror - that's the inside one - is stupid, dangerous and very likely illegal. You're supposed to look out THROUGH the windshield, not show everyone what religion you subscribe to, what your kid's baby shoes look like, your fuzzy dice, or - if there is a God, please save us - which Celine Dion CD you decided to dangle off there, blinding the rest of us with its reflections. True; beats having to listen to it. But I saw a new 'dangler' today, in a black Lexus. Looked like some sort of cross between a First Nations' dreamcatcher and a 1960s macrame wall hanging. Made of rope that must have been an inch thick. Took up about a fifth of the car's forward view. I don't have a photo, sorry - I was driving at the time. I mean, what's that for? A rope ladder in case the car rolls over? Now, I'm also sorry if I have offended someone's taste (or lack thereof) in music. But as a Toronto Blue Jays manager is once said to have remarked (approximately) to the very religious shortstop Tony Fernandez, "Tony, I know Christ died for our sins. But we're down 3-2 in the bottom of the ninth, two out, men on second and third, and you're up. There's a time and a place, and this ain't either." BTW, the same goes for stuffed animals on the hatshelf which block about half the rear window. Yes, your girlfriend/boyfriend/whoever was very sweet to give it (or - help us again - them) to you. But please: on your bed, on your couch, in the window of your home - not in your flippin' car. And no, they do NOT count towards using the HOV lanes. Drove down to Detroit on the weekend, taking the 402 through Sarnia (the Blue Water Bridge is not only cheaper - $3.00 each way, US or Canadian funds - than either Detroit connection, it's usually less crowded and there is a much shorter 'urban' section to drive through rather than having to wend your way through Windsor). (I did not take a photo because I was alone in the car...). Why don't we have clever messages like this on OUR pixelboard signs? Of course, the Americans typically don't have Daytime Running Lights, so they're usually flying even more stealthily than most of us. That said, as I have often noted herein, most of us are STILL flying stealthily because DRL doesn't light up the taillights on most cars. Everyone tired of me harping on this? So, when is Transport Canada going to fix this regulation? Either make DRL work taillights too, or at least require that DRL NOT turn on the instrument lighting so people won't be fooled into thinking their proper lights ARE on. Or, we could all just do what the Michigan signs say, turn on our headlights, Day or Night. It ain't rocket surgery, people. Good luck, or good management? Not sure which wag shoved that image of my head on the Robaxacet doll into last Friday's paper, previewing the story of my Targa Newfoundland crash. First, the arm sling. I did get a bruise on my right arm (not left, as the image suggests) but certainly nothing bad enough to warrant a sling! But it also states that it was a "lucky thing" that I am still alive to write about it. OK again, tongue in cheek. But I have heard other people say we were "lucky" and/or graced by divine intervention. Brian Bourbonniere my navigator and I were not hurt because we were lucky or were somehow "saved" - we were not hurt because we were PREPARED. Just as my favourite charity SMARTRISK says, when you're going to indulge in potentially dangerous behaviour, then among other things "buckle up" and "wear the gear". 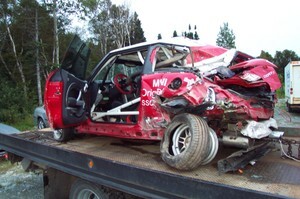 The organizers of all motorsport events demand that competitors equip their cars and their personages with safety equipment appropriate to the event. In our case, we went above and beyond. First, all Targa cars must have roll cages. 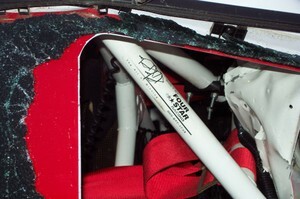 But our roll cage was built by Frank and Dan Sprongl of Four Star Motorsports in Georgetown Ontario. These guys have (a) been national and international rallying champions for ever, and (b) have had their share of big crashes, including one last year which has at least temporarily put Dan out of action. They know a thing or two about roll cages. I have had several American competitors examine our cage, and comment on its design and the fabrication skills that clearly went into it. If you're going to have a biggie like we did, you want a Sprongl cage on your side. From this photo, you can see how crunched the back end of our car was. But the damage stops right where the cage begins. The doors open and latch. The windshield, which is glued to the body shell in this and most modern cars, is not even cracked. That's one tough little car. Second, our seat belts are full five-point harnesses, as required by the rules. Any racer will tell you the last thing you do before starting off is tug on those shoulder straps one more time. I also do it again any time there is a bit of a straight stretch. Third, both Brian and I had new-last-year Bell helmets. We think Bell is the best name in the business, although their products are expensive. As the old joke goes, if you have a $150 head, buy a $150 helmet. Fourth, although the Head and Neck Support (HANS) device is not yet mandatory for Targa Newfoundland (rumour has it that it will be for next year, and it should be), we both had one, me for the second year, Brian for the first. After seeing what happened to us - i.e., nothing - I can't imagine anyone not wearing one. You never know what contribution any particular component of the safety system might have made the difference. But you try to put the odds in your favour. And we do know that you only get one crash per lifetime which needs a HANS device if you don't have one. OK, Dale Earnhardt didn't even appear to have his helmet done up, but if he had AND had been wearing a HANS device, he'd still be racing. No. If we had been lucky I would have made the corner, we would have finished the rally and probably carted home another nice trophy. Divine intervention? Sorry. Not buying that either.